Coming May 1, 2008, we will begin exploring the library of famous children authors and/or artists. Each month a favorite children author and/or artist will be featured. Free downloads will be offered to print and place in your child's personal library binder. The child will then use these forms to research each author/artist, use for copywork, and keep lists of the books they read. What a cute little worm. I think my kids will love it. What a fun idea, Cay! I can't wait to get started. What a GREAT idea!! Thanks Cay! 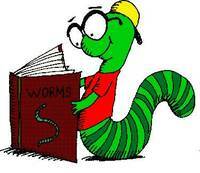 I hope its OK to use the little worm & book on my blog. If not, please let me know!